I've been using my Ulta coupons and doing some other bargain shopping in my free time and wanted to share with you 4 fantastic finds! Three came from Ulta and one from Walmart. Three are from the Sally Hansen Natural Beauty Inspired by Carmindy line. I found these items on sale at ULTA three weeks ago and I used my coupon from their ad. With my $5 off coupon, three items were $11! Your Skin Makeup in Ecru Beige (on sale for $6.99 before my coupon)--This is a very light shade with some yellow. I love it because it tones down the ruddiness in my cheeks. I am usually one to wear mineral makeup. Every fall, though, my skin becomes drier and mineral makeup is too drying for me. I do not like a heavy full coverage foundation. I like my own skin to show through. My skin has been treated very well for years, as I have taken care of it religiously since my first cosmetics job sophomore year of college. I just like to apply makeup to the ruddy or uneven areas as opposed to all over my face. This is slightly heavier than tinted moisturizer (using Smashbox Sheer Focus for reference), but also much creamier. It is perfect for those with normal to dry skin (normal to oily should fare well, too). Ingredients-wise, this is free of parabens and nasties. It isn't completely natural and not all of the ingredients are wholesome. Compared to almost any other drugstore or department store brands, though, this is a better foundation. What I actually like most is that this has all of the properties of an old favorite of mine from at least a decade ago--Estee Lauder Enlighten Foundation. 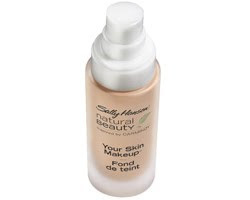 This was a sheer to light foundation that let your skin show through and just evened things out. It was creamy and the Natural Ivory was perfect for me. I wore this when I was working at the counter and it was a beautiful (but far from natural in terms of ingredients) product. Your Skin Makeup is so much like that old Lauder formula in terms of texture and appearance--I adore it! I apply this using the best foundation brush in any price range: the EcoTools Foundation Brush. Seriously--it is better than the foundation brushes from Shu Umera, Trish McEvoy and Cat Cosmetics (maker of great brushes). The EcoTools brush is $5.99 at Walgreens. I dampen the brush a bit, then blend the makeup right in. The Mountain Eye Palette (on sale for $4.99 before my coupon)-- This is a fabulous eye compact. Again, it is paraben free. The texture is silky soft, but not greasy or glittery. The colors are so soft and natural. The application is absolutely flawless. The Mountain is a palette of browns. There's a golden ivory beige, soft bronze, and cocoa shade. All are splendid. This palette could easily replace the $28 Smashbox Shutterspeed compact or the $56 Dior Incognito palette. The shadows are not completely matte, as there is a very slight shimmer. They are much more matte, though, than shimmery and I just love this formulation. I apply my makeup at 7 am most days and the shadow is still going strong at 11. That's staying power! Sheerest Cream Blush in Beaming ($3.99 on sale before coupon)-- This is my favorite product of the bunch. Again, it is paraben free. It says that is "may contain" carmine, so if this is an issue for you, the toll free number is always helpful when you want to be sure of which colors do or not not contain this ingredient. I have found that when I call, it is typically the russets and deeper shades that do contain carmine. I love cream blush this time of year. Love, love, love it! This formula rivals The Creamy Moist Glow by Kevin Aucoin. It is like mixing the Aucoin shades Bliss and Euphoria together ($24 each) to make this beautiful shade. I actually prefer this formulation, as it is creamy without being sticky. 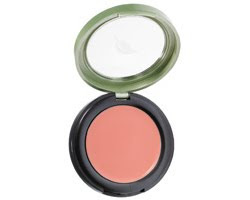 It is a cream blush that those with slightly oily skin will be able to wear as well. Beaming is a gorgeous shade. It looks a bit bright in the compact, but it is so very sheer that it just gives you that sheer and radiant glow. This product is phenomenal. I use my fingers to blend this into the apples of my cheeks. The last item came from Walmart. I am not a Walmart fan, quite frankly. In 2008, I went to Walmart three times and it is a mile away. Ben wanted to look at some toys the other day, so we went to Walmart. I was in there to look at their selection of Alba and Burt's Bees and found Hard Candy right across from the natural products. I was shocked! When I was younger and very experimental with my makeup, Hard Candy was a favorite, although it came online from Sephora at the time. Truth be told, I was shocked to see the line at Walmart, and pleasantly surprised by the price point (the most expensive item there is $9). Now Hard Candy is not a natural products line and they don't claim to be. Many products have ingredients lists with about 50+ items, several of which are parabens. I did find a concealer palette (it was $7 or $8) without parabens, though. The Nobody's Perfect palette contains 6 concealers: a golden yellow, soft green, lavender, and 3 varying shades of neutral. I am very pleasantly surprised! This is a nice palette. I have used the yellow shade mixed with the lightest neutral skin shade to use under the eyes. I also have used the green to tone down one spot that is a bit more ruddy than normal. The lavender won't be used, but for someone needing to tone down yellow or sallow tones, this will work like a charm! It blends well using my EcoTools Concealer Brush and applies beautifully over eye cream. In the morning, I use my eye balm, let it sink in for 5 minutes and then this concealer goes right over it. With my $5 off a $10 purchase at Ulta coupon and the low price on the Hard Candy palette at Walmart, I was able to buy the three Sally Hansen Natural Beauty items and the palette for under $20. Great deal!